A 4 CD CLAMSHELL BOXED SET FEATURING OFFICIAL BOOTLEGS OF TWO CLASSIC TANGERINE DREAM CONCERTS FROM THE FORD AUDITORIUM, DETROIT IN 1977 AND THE REGENT THEATRE, SYDNEY IN 1982. 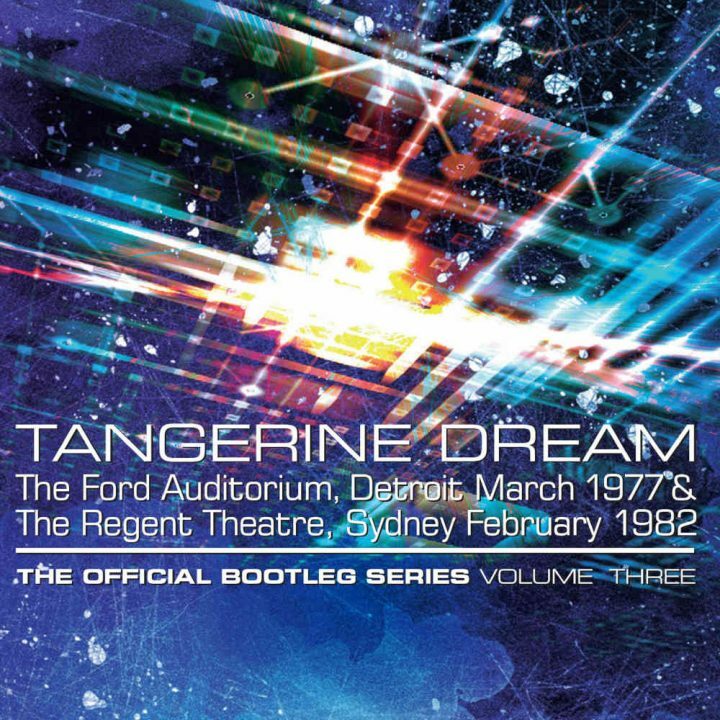 Esoteric Recordings’ REACTIVE label is proud to announce the release of the third volume of an official bootleg series by the legendary TANGERINE DREAM. Formed in Berlin in September 1967 by Edgar Froese, Tangerine Dream are simply one of the most important groups to have emerged on the German music scene of the late 1960s / early 1970s. Always guided by the genius of Edgar Froese, Tangerine Dream developed a sound based on the use of synthesisers and keyboards, first revealed on their marvellous “Alpha Centuari” album in 1971. This volume features recordings made at the Ford Auditorium in Detroit, USA in March 1977 and at the Regent Theatre, Sydney, Australia in February 1982 features over four hours of music and features two concerts that were voted as some of the finest bootlegs in existence in a recent poll of fans. The concert in Detroit has gone down in Tangerine Dream history as a legendary event. The music performed by Edgar Froese, Christopher Franke and Peter Baumann was exemplary, and featured Froese’s extensive use of Electric Guitar in the blistering set. The concert at the Regent Theatre in Sydney is from the next stage of Tangerine Dream’s career, featuring a line-up of Edgar Froese, Christopher Franke and Johannes Schmoelling and is another fine example of the excellence of Tangerine Dream on stage. This official 4CD clamshell boxed set has been re-mastered from the best available sources and includes a booklet with a new essay.